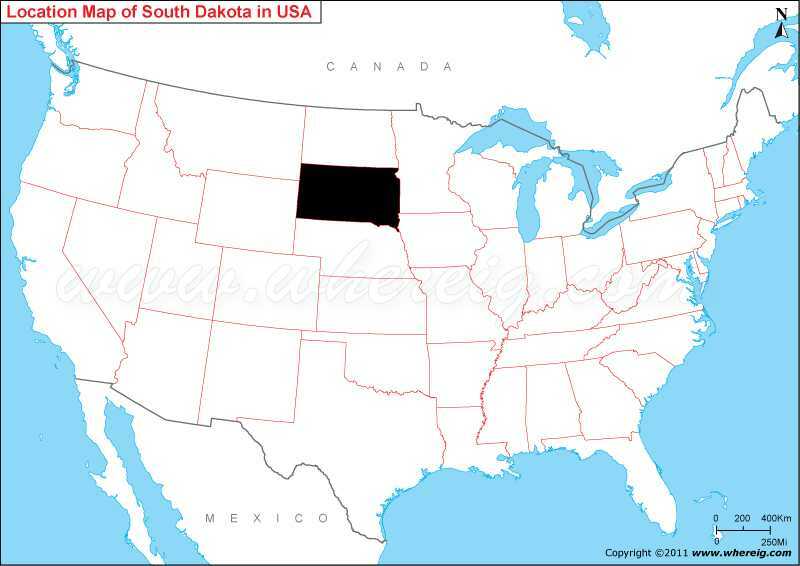 Where is South Dakota located on the US map? As shown in the given South Dakota location map that South Dakota is located in the Mid-western region of the United States. South Dakota map also shows that it shares its border with North Dakota in the north, Montana in the north-west, Wyoming in the west, Nebraska in the south, Iowa in the south-east, and Minnesota in the east. Interestingly, the name South Dakota is derived from the Lakota and Dakota Sioux American Indian Tribes. Sioux Falls is the largest and capital city of South Dakota. Geographically, Missouri River divides the state into two halves i.e. east and west. These two parts is not only geographically but these are also socially distinct from each other. The residents known as “East River,” it homes most of the state’s population as well as the available fertile soil facilitates people to cultivate verities of crops; and the second part is “West River,” it is sparsely populated region and the main occupation in this region is ranching and other agriculture activities. Besides, this part also generates revenue from the tourism industries. The most significant tourist point in the state is Mount Rushmore; some other points of interests are Badlands and Wind Cave national parks, the Crazy Horse Memorial, Custer State Park, and historic Deadwood. Black Hills located in this region is quite significant for religious purpose.